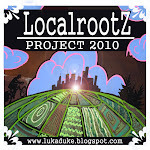 Localrootz Project: Stocking the Cellar. So the first week of September has come and the garden is still flourishing with delicious offerings. The wife and I decided this Labor Day weekend would be a great time to make some progress on our bounty and preserve plenty of summers tasty offerings. We used a recipe from one of my favorite local food blogs Diary of a Locavore ! Added some maple syrup and doubled everything up pretty much... we used these great 4 loaf mini bread pans we scored for $3ea @ Mardens. Found this recipe from Mother Earth News but we amped up the Garlic and variations of vinegar varieties to add more complexity and to be all fancy and cool. Really we just had a few partial bottles in the cupboard and I figured it would be a good experiment ! We don't get all fussy with tomato sauce, peels, seeds and all go into the caldron and simmer for 6 hours of so... start with the Onions, Garlic and Peppers browned in some Olive Oil and then unstick them with a dousing of red wine then pile the tomatoes in as you chop. Simmer for 2-3 hours skimming occasionally. Puree with a submersion hand held blender and simmer for a couple more hours till the liquid thickens slowly seasoning to taste as it nears completion. I always am very gentle on salt and herbs till the last two hours... if you over salt early it just gets more pronounced as the sauce concentrates and thickens. We are new to pickles... I have done a couple quick pickle batches using baby cukes from our old community plot but the excess of cucumbers at the homestead got me excited to play this year. We also have acquired some whey from Swallowtail Farm to make a big batch of lacto fermented pickles. Ill be starting that and a kimchi this week and discuss the pro's and con's to using vinegar and canning vs the lacto fermenting method. So much eggplant... after a few eggplant parms, grilling them whenever possible and thinking about other methods of eating them on a daily basis I was searching around to find a good eggplant canning option and this was the best one I could find that seemed plausible with what I has on hand. I found it on Ball's Website. We got a deal from a local farmer on some ripe tomatillos and went to town washing them, scorching them under the broiler, grilling up some veggies and filling some jars with this tangy green taste of summer. Looking forward to pouring this over some whitefish in the winter to get a glimpse of summer heat in a jar. *Denotes Ingredients not from Maine and Italics means it was homegrown ! What a productive weekend spent with my wife working hard in the kitchen and filling some cellar space. These are hopefully going to taste amazing once the snow starts flying.